You may have heard that Stampin’ Up! Has decided to retire the Stampin’ Trimmer and Big Shot at the end of this catalog. Here is my take from this announcement. Stampin’ Up! has always had the best products, the best value and the best customer and demo support and when products don’t live up to the high standards that Stampin’ Up! has built their business on something must change! The trimmer blades have been a manufacturing issue for a while now, leaving many frustrated with frayed edges. After multiple attempts to work with the manufacturer to remedy the situation it is time to retire the product and go back to the drawing board. After many issues with dies on backorder, or unorderable status, Stampin’ Up! has decided to part ways with Sizzix, the middle man in our die manufacturing and the parent company of the Big Shot. While this may be shocking to some, what it really does is allow Stampin’ Up! to cut out the middle man, and work directly with a manufacturer to produce our dies and embossing folders. More control is key to this! That being said, a new option will be on the horizon. 1) If you have a trimmer, order additional blades now, limit 3 sets until 4-15 then you may order 6 sets. Stay tuned for a new trimmer option, but not with the new catalog debut. 2) You will still need a die cutting/embossing machine to use these items, so go ahead and order a Big Shot or if you already have one, order extra cutting plates. Rest assured, once Stampin’ Up! has retired the Big Shot you can still find cutting plates etc. at your local craft store or online. Stay tuned for a new option, but not with the new catalog debut. Place an online order of $50 or more through my website and be placed into a drawing for a now retired SAB stamp set! Orders must be placed by April 30th The winner will be announced on my Facebook page on May 1st. Do you remember the days of receiving letters in the mail? As a child I had a pen pal and what fun it was when a letter from her came in the mail! Fast forward to modern day, do you get letters or cards in the mail? Do you feel nostalgic when you find a letter, card or even a simple piece of tape on the back of a photo frame that has your grandmother’s handwriting on it? I do, and this is in part why I create and teach card making. My goal is to start sending out cards I make to those who are important to me, my family, friends, people who attend my classes, people who place orders with me and the list goes on. We as a society are losing the art of letter writing, the art of handwriting in this digital age, but think about how special that note, card, letter or piece of tape in your beloved family members handwriting is now that they have passed away. So join me in helping to preserve this rapidly disappearing art, create a card and send it to someone special. Have you had a stamp set or 3 on your wish list? Well today is your day! Stampers and crafters the next round of the rolling 48 hour sales at Stampin’ Up! has started! Stamp sets (excludes special bundling pricing) and Kits, in the Annual Catalog, are now 10% off, but act now in order to avoid disappointment as quantities are limited! Wanting to place an order? Visit my online store: stampintammy.stampinup.net and choose the shop now option, if you need assistance I am happy to help! Enjoy, and as always, thank you for choosing me as your Demonstrator! Hi everyone, I hope y’all had a great Thanksgiving. I worked at my day job as a Charge Nurse on a busy Orthopedic and Trauma Unit. My husband, youngest son and Mother in Law went to our local American Legion Community Pot Luck dinner. Yesterday we had a lovely meal with my dad and step-mom! Did you know that I am a small business owner as an Independent Stampin Up Demonstrator. I love paper crafting, card making and simple watercoloring. Stampin Up is having 6 days of Black Friday sales! Today is the day to stock up on paper and embellishments. (Have I mentioned that the paper is FABULOUS, specially formulated for great ink images) The details are in the graphics below! Stay tuned as I share new designs! Take care and share a card with a friend! Friends, do you ever plan to make your cards only to find you have waited too long to get started and now feel overwhelmed? I do!! I have a few solutions for you! Sign up for Paper Pumpkin by November 10th and you will receive an all inclusive kit to put together your handmade cards (you can order more than 1 Kit if you wish!) 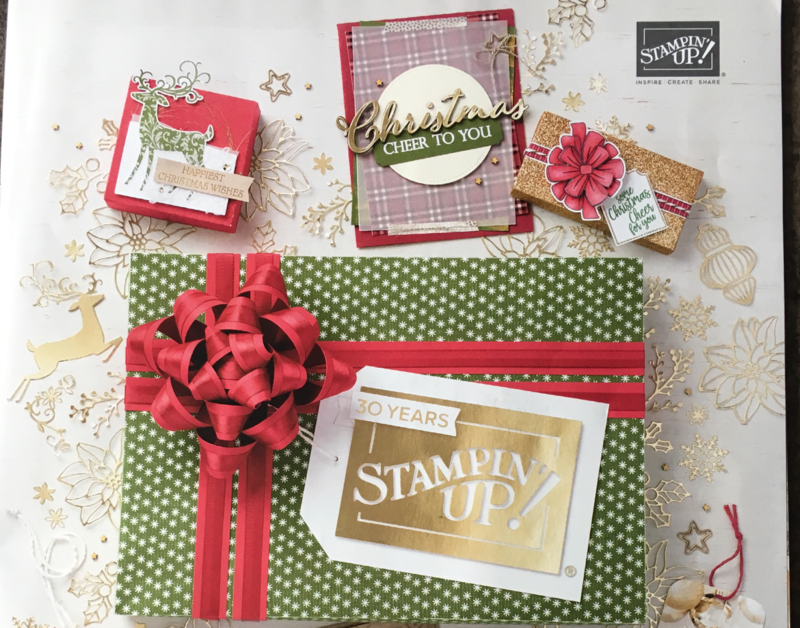 Or give Stampin Up card kits a try, they are beautiful and can be found in the Holiday catalog on my online store website. Lastly, sign up for my card class coming up on Sunday November 18th at A Place To Create in Washougal! Hi stampers and crafters! I am excited to bring to you our BEAUTIFUL Snowflake Showcase. This is a limited time only selection of products that are a must have, yes it is snowflakes, BUT so much more! The product collection is 2 stamp sets, Thinlit Dies, Snowflake trinkets and white velvet sheets of paper! The Happiness Surrounds stamp set and Snowfall Thinlits Dies are not just for Christmas and Winter scenes. Supplies are limited and the sale period is only through the month of November so order yours today! Contact me if you have any questions or need assistance, I am happy to help! Paper Pumpkin is a great option for those new to paper crafting, those that are on a tight budget, those who have tight storage space, those who travel, are you getting my jest? Paper Pumpkin is for everyone! It is an all inclusive box delivered to your mailbox with a monthly subscription. When I say all inclusive, I mean it has EVERYTHING you need to complete the projects and then some! There is no better time to sign up for Paper Pumpkin than today, be sure to use promo code FLASH1018 for your $5.00 (yes that is correct!) for new subscribers only! Good through October 9th unless they sell out before!